LEVIATHAN MANUFACTURING CONCERN Ltd., S.A. This brochure displays a line of products of a sculptural nature. The Brochure conforms to others of its type. Its intention is to inspire viewers to order the objects depicted within. The first principle of marketing is to decide what people need or want. The other principles that follow depend on this first principle being fully understood and agreed upon. The Leviathan Manufacturing Concern has come to the conclusion that these Million Chrysanthemum Joys wall Sculptures are exactly what people need and want. The notes on each Sculpture explain the reasoning behind this conclusion. The Leviathan Manufacturing Concern is a privately held company dedicated to the proposition that the sale of objects of an artistic nature is beneficial to the well being of the planet. 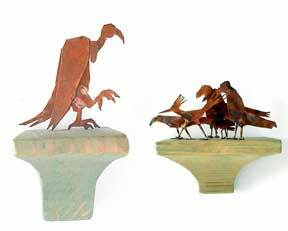 The Sculptures depicted here-in are made of copper and wood. The figures are cut, by our craftsmen, from 32oz. copper sheet. The bases are cut from fir lumber. The bases are stained and sealed with polyurethane. 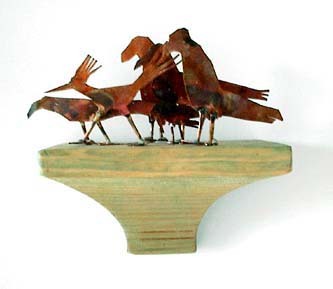 The Sculptures are 6-9" high, 3-7" wide and 3-4"deep. The bases have a hole drilled in back for wall mounting purposes. The Sculptures weigh 7-9 ounces. Some units are sold in pairs, Poseidon Ashore and Vulture Lessons. The name Million Chrysanthemum Joys is our attempt to imbue this line of Sculpture with an aura of ancient Chinese mysticism. Thus satisfying our craving for the enigmatic and inscrutable. The ideogram for Million Chrysanthemum Joys can also be read as "Too Lucky Waves". The Sculptors that Leviathan Manufacturing Concern has employed to design these Sculptures, John Massee and Bjarne Sletteland are solely responsible for the content/intent and style of these objects. Various experts have been consulted to analyze these Sculptures. 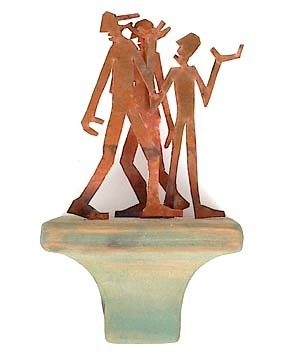 Their views, insights and opinions have been excerpted and used in the text describing each Sculpture. The views, insights and opinions expressed do not necessarily reflect the views, insights or opinions of Leviathan Manufacturing Concern. Prices have changed dramatically since inception of this business! 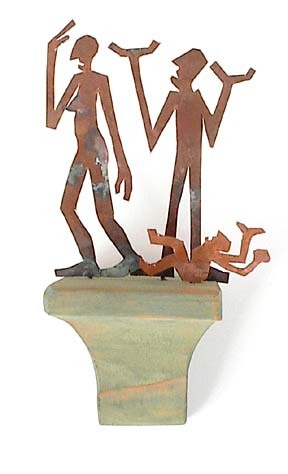 One of our most biting socio/politically critical Sculptures. Also the most popular item in our inventory. A comment on the capitalistic socio/political climate. Subtle in its implications it has mistakenly been viewed as a humorously delightful, simple comment on the western Art genre. While this misunderstanding worries us we will accept this public misconception. 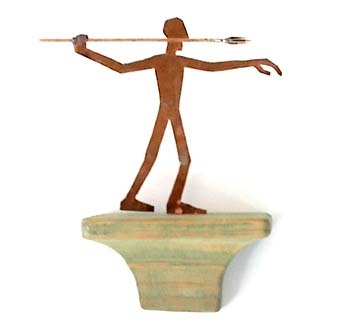 We hope that this Sculpture will resonate in the consciousness of the buyer and influence them to eschew greed and avarice. While this Sculpture properly belongs in the Indigestible Animals brochure we could not resist including it here as it is such a hearty seller. An eternal motif suitable as a gift for those concerned with these matters. Battle scenes have inevitably occupied the Sculptural Consciousness. 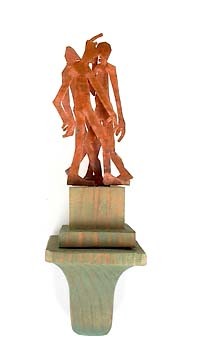 Both the Patrons of Sculptures and Sculptors themselves have made this one of the most ubiquitous of Sculptural forms. A few of the reasons for this genres' ubiquity are; Sculptors have often been of the male gender and thus have a fascination for the violence and mystique of Glory, Honor, Courage and other befogging notions, the need for governing bodies to proclaim their 'Victories' to reinforce their validity, the mere desire of Sculptors to produce scenes of action. 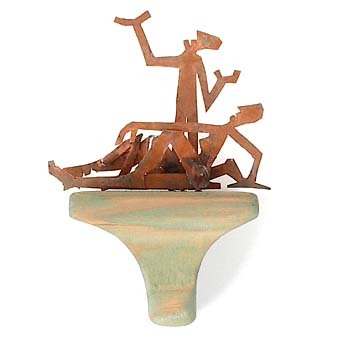 There exists a separate brochure entitled," UNSPEAKABLE IMAGES", that contains many more Sculptures of this genre and its ancilliatory forms; Man fighting man, centaurs, amazons, animals, allegories, demons etc..
We have included this example in this brochure to demonstrate the complete nature of Leviathan Manufacturing Concern's Sculptural Awareness. The idea of family though quite popular in many circles has been found by the staff at Leviathan Manufacturing Concern to not be an institution overwrought with un-alloyed joy. In fact one of the more salient verities of this institution appears to be its disputatious aspects. Although we at Leviathan Manufacturing Concern do not condone this aspect we thought it mete and proper to bring it to the fore of our consciousnesses in the hope that it might be dealt with. We don't know what this Sculpture is about nor what it refers to. The relationship between the two men and the woman is unclear. The difference in size of the two men implies an hierarchy but this is questionable. The poses suggest emotion/states that seem to have no relation to each other. The title is oxymoronic at best. 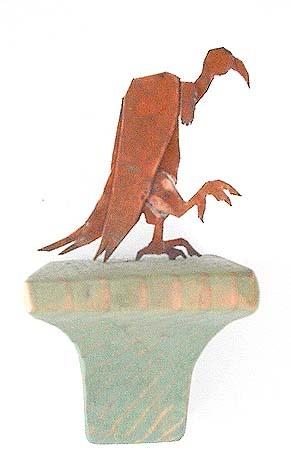 There has been some speculation that this Skulpture, (sic), might embody the ur-form of the genre. We await the publication of various papers. An ancient Greek Statue dredged from the sea was used for centuries as a model for the ideal form for the modeling of figures. The original Sculpture was given the name "Poseidon" because it was thought to have been wielding a trident. We, at Leviathan Manufacturing Concern have been unable to find out why. Poseidon, a bellicose God, was variously malevolent as Greek Gods were wont to be. We assume that were he on land he would go about slaughtering things as much as he did at sea. 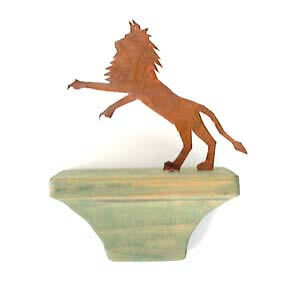 We chose a dry land animal, the Lion, in juxtaposition to the aqueous Poseidon thinking we were being clever. We've since been berated for the violence this scene implies. We remain un-apologetic but will sell each figure separately if we must. Contact our Sensitivity Coordinator, John Massee for details. An odalisque, a female slave or concubine, has been an interesting Sculptural motif. The depiction of a reclining female has at various times in history been both a powerful image in the fight for the Emancipation of Women as well as a despised icon of the evils of a Patriarchal Society as well as epitomizing the objectification of female sexuality. 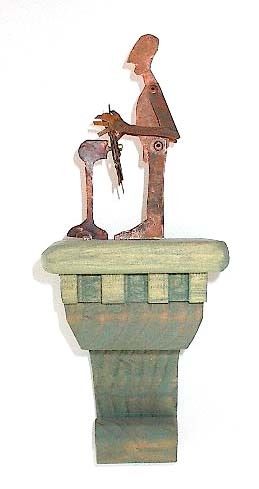 Like all interesting and important Sculptural motifs it embodies a self contradictory ambiguity. 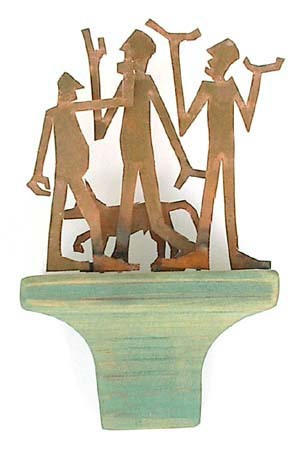 The male figures, (no breasts), seem to be adoring and praising this Motif. Noah, a man of great foresight and ability. A personage not to be forgotten or, we feel, relegated to the realm of religious fiction. There is available a whole ark full of animals. See Brochure #0201.9, Indigestible Animals. 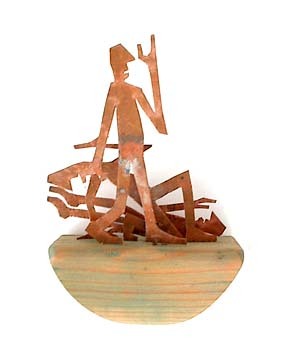 Although this Sculpture is titled "NOAH", it could just as well be titled "The Captain", which would imply another series of implications and connotations. At the time of publication we at Leviathan Manufacturing Concern settled on the "NOAH" title because we could then mention the Indigestible Animals brochure. The concept of Victory implies the vanquished. As much as we at Leviathan Manufacturing Concern abhor the concept of vanquishing any humans or animals we realize that this has been a Sculptural Motif well used through-out the centuries. The vanquished or defeated in this Sculpture can be seen in an allegorical sense. The two anterior figures could be called; Despair and Disdain, Famine and Ignorance or any other distasteful aspect of Human Existence. 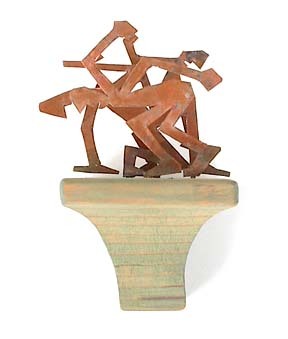 A model of a Sculptural maquette that when the full 20' tall Sculpture is completed will be titled GIANT DANCE. 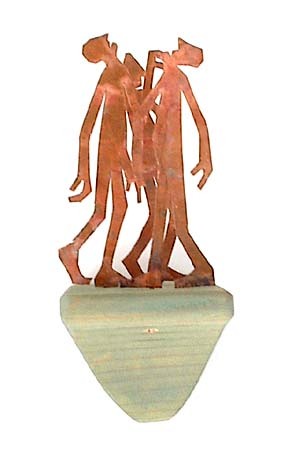 Two male figures and one female, (note the breast on the middle figure), are walking in different direction, (senselessly? ), with self-absorbed demeanors. This refers to the myth of the fading of heroic giganticism expressed as an allegory for the paucity of ecstatic revelation during the later half of the 1st century B.C., (see; Albert Hagerfield’s, “Giants Time And Nonsense”, Hapsburg Press 1876). The problems of the world; patriarchy, war, hunger, greed, globalization, hatred, love, class, gender and race are concisely dealt with here. Three male Giants, (hero/patriot/patriarchs), are depicted wandering clueless in the universe. The feminine base upon which they stand and the wall on which they’re hung create the context post-priori of their soi-generis paradigm. This, the most existential Sculpture of the Million Chrysanthemum Joys line will soon be constructed full size, (20’ tall), complete with attachments and vending abilities.